The Chinese New Year is on 5th February and for 2019 we’re entering the year of the Pig! Find out more about your Chinese Zodiac and how this year will play out according to the Chinese zodiac system. 2019 is the year of the “earth pig”, the next one will be a “metal pig” in 2031. The pig is the last animal in the Chinese Zodiac so represents a time where we need to look back over the last 12 years and see how far we’ve come – celebrate our successes and see where we need to make changes to improve. People born in the year of the pig are said to be friendly, generous and fun-loving. They appreciate comfort and tend to be happy go lucky in life, with abundance flowing to them easily. This will reflect on 2019, where there’ll be an emphasis on working hard at our goals, but also balancing that with having a good time. We’ll need to watch out for people who might take advantage of our good-natured generosity and stay focused on our goals instead of getting distracted with indulgence or too much of a good thing. How will the Year of the Pig affect your Chinese Zodiac sign? *Remember that the Chinese year runs from February to February so if you’re born in January, you’ll be the previous sign. Use your natural inquisitive nature this year to take your career into new directions as well as trying new hobbies and perhaps even learning a new skill. Your crafty nature will bring you exciting possibilities. 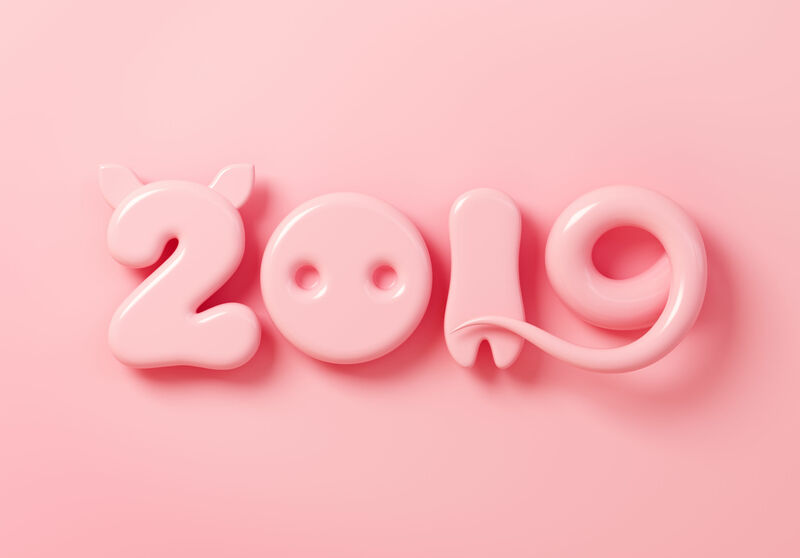 Keep that slow and steady attitude going with your eyes on the prize and the year of the pig could be seriously beneficial for you in the material world! Promotions or extra cash could be on the cards if you work for it. You might need to adjust in some way as the year of the pig is more about humility and happy-go-lucky connections than your tiger power! Apply your intensity to work and aim to go with the flow. This year you’ll have more confidence in your abilities and find yourself making useful and positive connections. Last year might have been a bit worrying but all that will improve as long as you give it your all. Under the influence of the calm and content pig, you’ll probably find yourself looking at things from different angles and perhaps even embarking on something out of your comfort zone. You can relax this year so why not try something different? You’ll have your work cut out for you this year as the pig is the snake’s natural opposition and the two are said not to get along! Use your smarts, intuition and persuasive nature to work your way up and take breaks to hide when things feel too much. You have a natural affinity with the pig so this will be a good year for you, as long as you keep up that impressive stamina and stay calm when things get a little unpredictable. If you need to, get some energy out with a regular exercise routine. Take any opportunity available to you this year as there’ll be plenty coming your way and you’ll find yourself quite content with whatever comes your way. Try not to lose your ambition and just accept what’s offered to you though – you might do better! Who knows what’s ahead for you – with your playful demeanor it could be anything, though you’ll be happy to know that there are plenty of fun new adventures and connections on the cards for you. Just make sure to keep yourself grounded at times too. You’ll be relying on other people a bit this year so make sure to nurture connections and let go of any that aren’t serving you anymore. Keep a good balance between knowing when to take the lead and when to compromise and you’ll see plenty of successes. Make sure you’re putting effort into your own path this year, whether that’s in creative pursuits, work or relationships, try not to lean on other people and put yourself first whenever you can. Though you’ll still need others, your independence will bring confidence and rewards. This is your year so work it! Try not to get side-tracked in other people’s issues or demands and focus on what you want to bring into existence. Of course, make sure you’re having fun along the way and share that sunny disposition with those you love whenever you can! Speak to one of our expert PSYCHIC READERS today to find out what the planets and stars hold in store for you this New Year 2019.